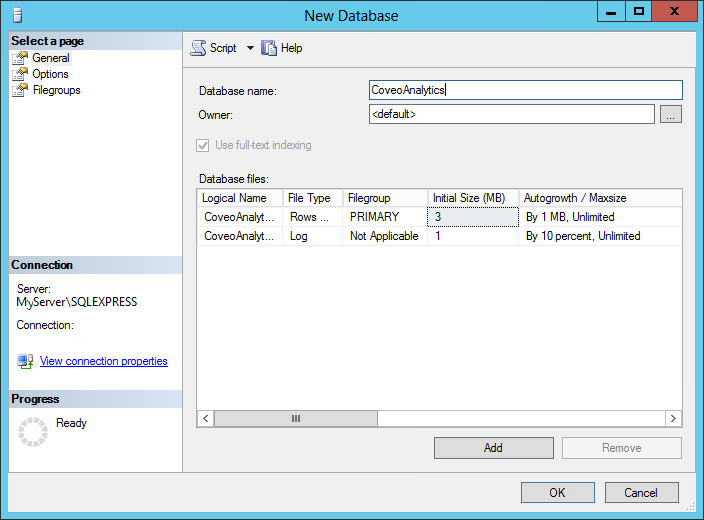 You may need to create a database in a Microsoft SQL Server, for example to create the database needed for the Coveo Usage Analytics module. Connect to the computer where Microsoft SQL Server is installed using an administrator account. In Server type, select Database Engine. In Server name, type or select the name of your SQL server instance in the form <hostname>\<SQL_instance_name>. 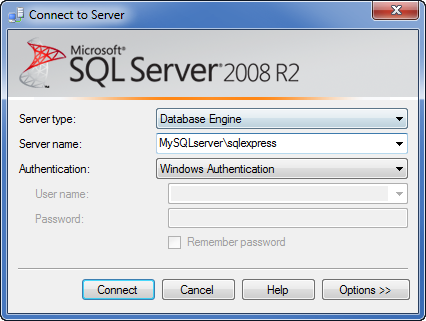 Example: On a server named MyServer, when using SQL Express with the default instance name, enter MyServer\sqlexpress. In Authentication, select Windows Authentication. 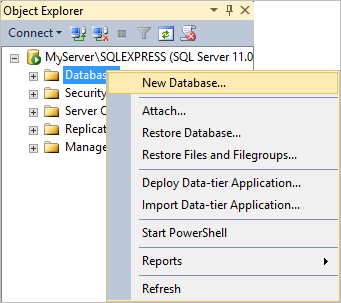 In Microsoft SQL Server Management Studio, in the Object Explorer, right-click on Databases, and then select New Database in the contextual menu. In the New Database dialog box, in Database name, enter the desired database name, and then click OK. 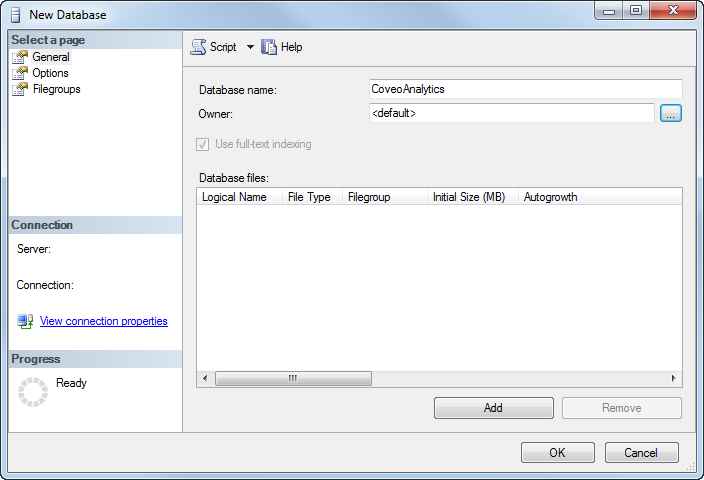 Example: In the case of the Usage Analytics Module, enter the default Usage Analytics database name: CoveoAnalytics. You can use a different Usage Analytics database name, but you will need to specify this name in the Web.config file. Also, before running the database creation script, you will need to edit the first line of the database creation script to replace the default database name with the name you selected. 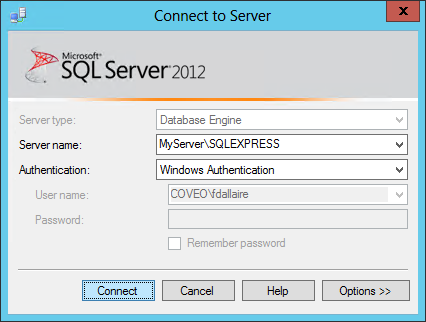 Connect to the Microsoft SQL Server computer using an administrator account. Start Microsoft SQL Server Management Studio (on the Windows taskbar, select Start > All Programs > Microsoft SQL Server 2008 > SQL Server Management Studio). 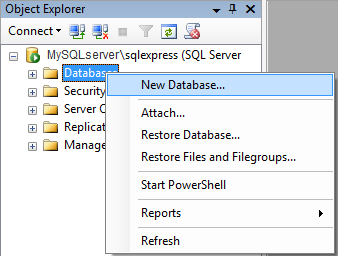 Example: On a server named MySQLserver, when using SQL Express with the default instance name, enter MySQLserver\sqlexpress.